Recently I was very lucky to receive an invite to attend the opening session of Jacobs Creek Pop-Up Wine & Dine Experience. Over the course of 4 nights, this event offered fans of Jacobs Creek the opportunity to learn about wine during a master wine class with David Whelehan (@Whelehanswines) while enjoying some canapes and a 3 course meal cooked by chef Clodagh Mc Kenna. All this was promised to take place in a super secret location, which would be revealed just before the event. The location did indeed turn out to be surprise - the Crypt in Christchurch Cathedral. 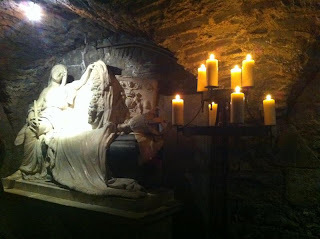 Upon receiving the news, I had visions of tombs & coffins, but the reality turned out to be far more sophisticated and elegant than I could ever had imagined. A mixture of low-lighting and candlelight created an intimate atmosphere against which we were treated to canapes, a classical string quartet and of courses, glasses of Jacobs Creek Sparkling Rosé. As a confirmed lover of all bubbly wines, I have to say that this rosé is light and fresh with lots of lovely berry flavours. After mingling and chatting, we were shown to our beautifully set tables. We were seated with the energetic Paula from Where's My Parade (who I also chatted with on the Campo Viejo Tapas Trail) and Joanna Schaffalitzky from the Irish-Danish food blog Smörgåsblog. David Whelehan took to the floor and proved to be both entertaining and educating as he went through some of the basic language of wine. Part of our challenge was to blind taste test some white and red wines. For this we had to don the provided eyemasks which definitely changed the whole experience. 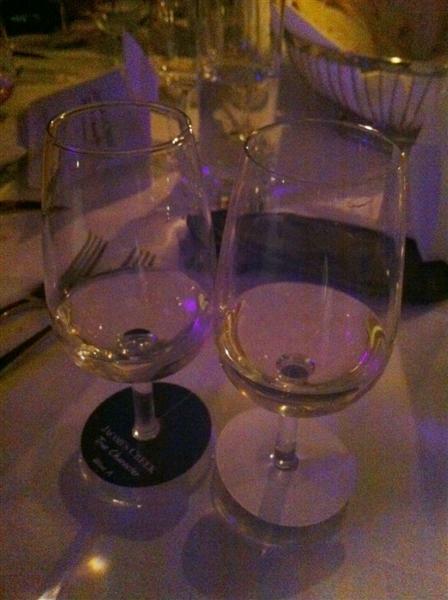 White wine 1 was no problem, as I quickly guessed a Sauvignon Blanc but wine 2 was a little more problematic. It seemed like a Chardonnay but much more sophisticated than normal with lovely caramel tones. It was revealed to be a Jacobs Creek Reserve Chardonnay - definitely one I'll buy in future and one which has caused me to reconsider my general opinion of chardonnays. I was later pleased to also guess both reds correctly, particularly because red wine is not my usual tipple. A large part of the fun was to be found in discussing the flavours with my dining companions - many different opinions were expressed, and even though we might all have been in agreement on the wine variety, each of us tasted it in different ways. For one wine, I was hearing the words "muddy" while at the other end I could hear "blackcurrant". It serves to remind how wine can be an individual experience! I want to thank Jacobs Creek for giving us the opportunity to participate in what was a fun and elegant night. BTW a tip we picked up from Mr. Whelehan when looking to impress in matters oenological - simply describe a wine as "elegant" with "bright fruits" and "sophisticated". Sounds just like moi, eh?